The U.S. Retirement Market is in BIG TROUBLE as annual benefits paid out are now larger than total contributions. Actually, the amount of net withdrawals were the highest in history. When payouts become larger than contributions… then we have the making of the typical PONZI SCHEME. As we can see, the U.S. Retirement Market has nearly doubled since the collapse of the Housing & Banking sectors in 2008. 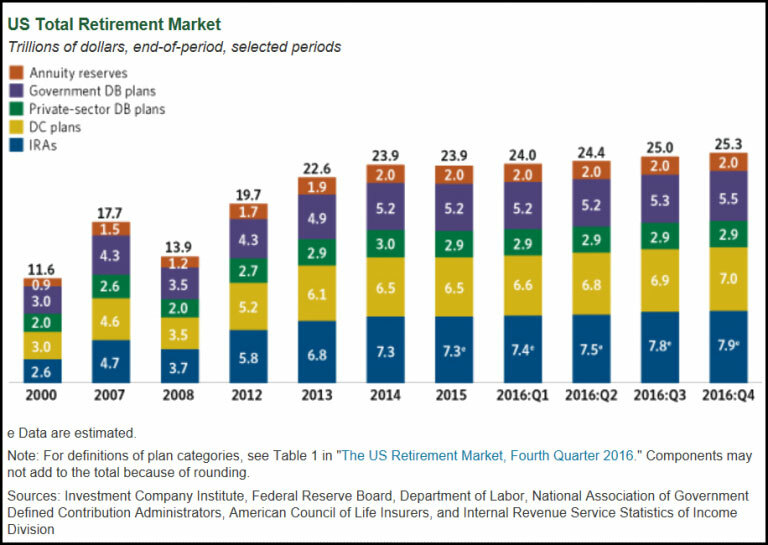 Total value of the U.S. Retirement Market increased from a low of $13.9 trillion in 2008 to $25.3 trillion at the end of 2016. It’s not quite double... but close enough. 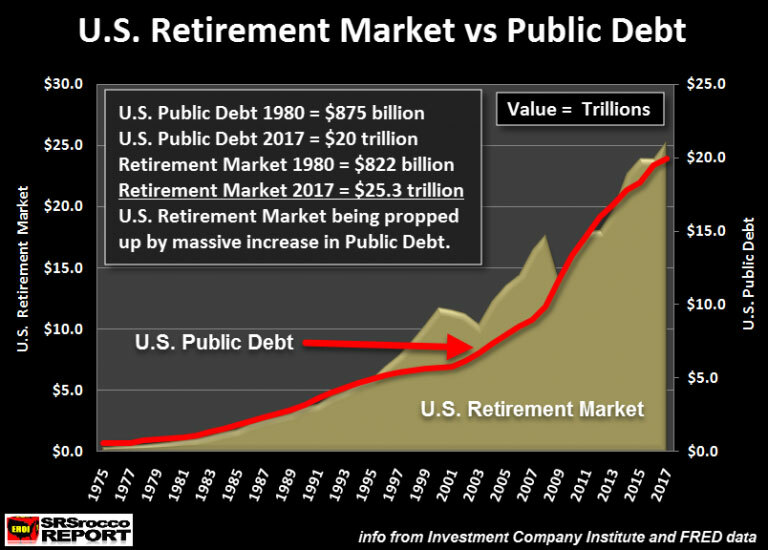 Furthermore, the surge in U.S. Retirement assets from $19.7 trillion in 2012 to $22.6 trillion in 2013 was due to the Federal Reserve QE 3 policy (Quantitative Easing #3). This was the year that the monetary stimulus was funneled into the Stock, Bond and Real Estate Market and away from the precious metals. Thus, the precious metals suffered huge price declines in 2013. The grey bars represent total contributions while the red line shows total benefits paid. The net result is shown in the GREEN & RED bars at the lower part of the chart. Green bars are positive net contributions, while the red bars are net withdrawals. Unfortunately, the Investment Company Institute does not provide data for 2015 or 2016 yet. It will be interesting to see if these net withdrawals continue to increase. My gut tells me that they most likely have. 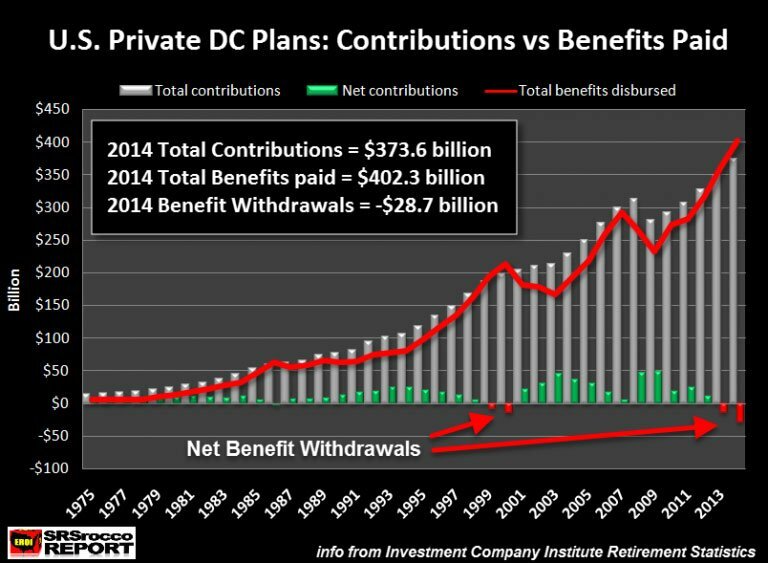 NOTE: The majority of the Private-Sector DC Plans were 401k’s, which accounted for roughly 98% of total contributions and 91% of total benefits paid. DEBT IS NOT AN ASSET. Also, the true value is subtracting total debt from total assets. Thus, if we just applied simple math here, the U.S. Retirement market’s net value is approximately $5 trillion… 80% less than what it is currently. And that $5 trillion figure is likely inflated. I do realize I am making a very general calculation here, but DEBTS are not ASSETS. The reason the U.S. Retirement Market is a huge Ponzi Scheme is that it has stored “Digital IOU’s” rather than real physical wealth. A typical stock price is based on “Net Present Value.” They take the future value of the company’s earnings and give it a price today. Unfortunately, companies earnings are based on the burning energy in the future. There lies the rub. Back during the 1930’s, most stock prices were based on the BOOK VALUE. Basically, what the value of the company was worth if all its assets were sold. Today, a stock price is based on EARNINGS. Earnings can and will implode when the markets crack due to massive debt and falling oil production. However, the few Americans who were wise enough to purchase physical precious metals rather than put their money into the Greatest Ponzi Scheme in history, will be protect wealth while most paper assets disintegrate. r If an American had $100,000 in their 401K, they would have to pay a 10% penalty for early withdrawal. While a 401K withdrawal is taxed as regular income compared to physical gold taxed at a maximum of 28% capital gains, at least can hold onto nearly three-quarters of your wealth. That being said, once the market crash occurs, the value of most American’s retirement assets are going to implode. I would not be surprised to see at least 50-75% collapse (or more) in the typical U.S. Retirement Account. Thus, the $100,000 invested in a 401K could fall to a low of $25,000, while $100,000 invested in physical gold, could easily double to $200,000. Actually, this is the likely outcome. Mark my words. A typical American who has invested $100,000 into a typical 401K will find that his or her retirement account will fall to one-tenth its value versus someone who purchased physical gold instead. The coming collapse of the U.S. and Global Oil Industries, due to lower oil prices, will be the factor that destroys the U.S. Retirement Ponzi Scheme. It is not a matter of IF, it is a matter of WHEN.